The East Africa region includes some of the most populated but most economically disadvantaged countries in the world. In this region, competing economic and healthcare priorities detract from chronic rheumatic disease management. Rheumatology clinical capacity is limited in most countries and completely lacking in others. In partnership with local physician champions in Kenya and Ethiopia, we are trying to raise awareness of this care disparity in order to optimize the management of people afflicted with rheumatic disorders. Pediatric rheumatology in Kenya: Prior to 2015, there were no pediatric rheumatologists in Kenya. Today, there are two. Dr. Scuccimarri (McGill University) facilitated the training of and continues to provide mentorship for Dr. Migowa, one of these pediatric rheumatologists. With partial funding from a Canadian-African Research Exchange Grant (Association of Universities and Colleges of Canada), Drs. Scuccimarri, Colmegna and Migowa provided teaching locally; developed a teaching aid based on the pediatric Gait, Arms, Legs and Spine (pGALS) screening tool; and together with Drs. Hitchon and Bernatsky worked on describing the burden of pediatric musculoskeletal disorders at one of the main pediatric hospitals in Kenya. The funds also provided introductory epidemiology research training for a pediatrician. This work, which began in 2011, is being continued by the local faculty with ongoing support from the Canadian rheumatology group. Adult rheumatology in Ethiopia: Ethiopia, a country of extreme need, has no practicing rheumatologists. The sole public rheumatology clinic in the country is located at Tikur Anbessa Hospital in Addis Ababa. Rheumatology care is provided by internists with limited experience in rheumatology. With highly engaged and supportive local faculty, Drs. Melkie and Tadese (current and past Internal Medicine department heads), our volunteer rheumatology team (Drs. Colmegna, Hitchon and Scuccimarri and our U.S. colleague Dr. Meltzer) has conducted several rheumatology seminars including hands-on MSK clinical skills training. Through a newly established registered charity in the U.S. (rheumatologyforall.org), we are now able to fund rheumatology training for two newly graduated internists. The identified candidates will begin their training in South Africa shortly. Informed by a model used for other medical specialties, we are establishing a rotation of visiting volunteer rheumatologists to provide teaching and mentorship to internal medicine trainees until the newly trained rheumatologists are able to take over. 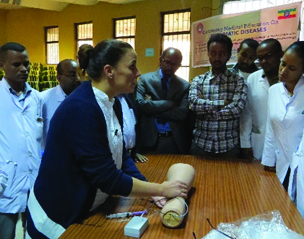 Dr. Rosie Scuccimarri in Addis Ababa, Ethiopia. Dr. Ines Colmegna in Addis Ababa, Ethiopia. Adapting recommendations for methotrexate in rheumatic disease to Africa: Most rheumatology management guidelines do not consider the realities of providing care in low-income countries such as Africa with their unique financial, social and medical concerns. With a small grant from ILAR, our team of Canadian, American and Ethiopian clinicians is undertaking the daunting task of adapting recommendations for using methotrexate in rheumatic disease to address the realities of low-income countries. Needs assessments with stakeholders in Ethiopia and across Africa, systematic literature reviews and Delphi processes to refine recommendations are in progress. Through many years of commitment and dedication, small steps have been taken and very promising improvements have been realized. Yet significant challenges remain for rheumatology patients in Africa and other low-income regions of the world. It is our collective responsibility to work together to improve rheumatology care for all.